Nothing says “celebrate!” during the winter-holiday season like a gorgeous, plump, juicy golden turkey from the oven. Over the years, I’ve experimented with dozens of different turkey preparations, including deep-frying. But the following method of brining and roasting—one that I get requests for over and over each Thanksgiving or Christmas—will guarantee that this year’s bird will be the best ever! Seriously; try it. Nothing can spoil Thanksgiving dinner faster than killing off a few of your guests with an undercooked bird. So, here is my strategy to ensure that your Thanksgiving is a delicious success—with no casualties. First of all, don’t buy one of those self-basting turkeys with vegetable oil injected into them. They’re … fowl. Figure out how many people you’ll be feeding, and plan on about half a pound of turkey per person. That’ll leave plenty of leftovers for sandwiches, soups, and stews—maybe even turkey tetrazzini. Oh, and consider buying two smaller turkeys rather than one large one. They’ll cook faster, and you’ll have twice as many wings, thighs and drumsticks. 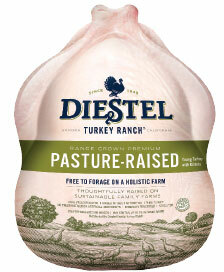 I prefer un-basted, natural, free-range turkeys. You can special-order them at most supermarkets or pick them up at stores such as Liberty Heights Fresh and Whole Foods Market. Buy the turkey a few days before Thanksgiving and give it two or three days to defrost in the fridge, if frozen. Don’t come home from the store with a rock-hard frozen turkey on Thanksgiving eve and expect to eat it the next day. Also, if you purchase a turkey with one of those little plastic pop-up timers, you’ll discover that they are, well, turkeys. They’re pretty unreliable, so use a meat thermometer such as Utah-made Thermapen to test a turkey for doneness. I have found that brining the bird the night before cooking helps to ensure that the turkey will be moist and tender. Brining makes a noticeable difference in the texture and flavor of the turkey meat, too. Here’s how to do it: Dissolve 2 cups of kosher salt or 1 cup of regular table salt in 2 gallons of cold water in a clean bucket, large stock pot, or lobster pot. Place the turkey in the pot and refrigerate, or keep in a very cool place (40 degrees or lower) for 8-12 hours. I usually brine the turkey on Thanksgiving Eve and put it out in the cold garage. In the morning, I remove the turkey from the brine and rinse it thoroughly inside and out until all traces of the salt are removed. The problem with cooking most large turkeys is that by the time the dark meat is done, the breast is typically overcooked and dry. So here’s how to help remedy that: After the turkey is defrosted but still in the fridge, fill a large Ziploc bag full of ice cubes. 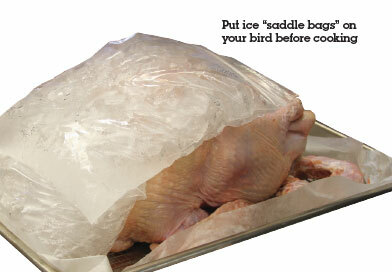 Lay the ice pack over the turkey breast in the refrigerator like saddlebags. The ice will keep the breast cooler than the rest of the bird. Keep the ice pack on the breast until you’re ready to put the turkey in the oven. You won’t believe what a difference this simple trick will make! Health experts don’t recommend cooking a turkey with stuffing or dressing in the turkey cavity. But if you must, only stuff a turkey right before roasting since stuffing sitting in an uncooked turkey can develop nasty and dangerous bacteria. 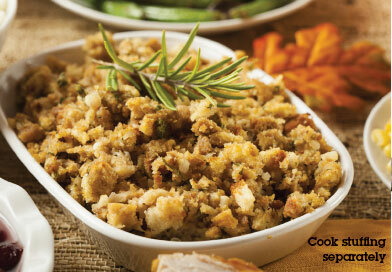 It’s better to cook your stuffing separately from the turkey. The turkey will cook faster and the stuffing won’t be saturated with fat. Here is my method for cooking a 15-18 pound turkey. You can modify the recipe using herbs, rubs, sauces, or whatever on the turkey. But this is the simplest, most straightforward way I know of cooking the perfect holiday bird. Adjust the oven rack to its lowest position. Heat the oven to 400 degrees. Remove the neck and giblets from the turkey’s body cavity. (If you brined your bird, you’ll already have done this.) Remove the icepack saddle bags described above. Rinse the turkey with cold water inside and out and pat dry with paper towels. Brush or rub the turkey with 3-4 tablespoons of melted unsalted butter. Generously sprinkle the turkey inside and out with salt and freshly ground black pepper (you can also add herbs like thyme, rosemary, etc. at this stage if you wish). Place an onion, quartered, inside the turkey cavity. 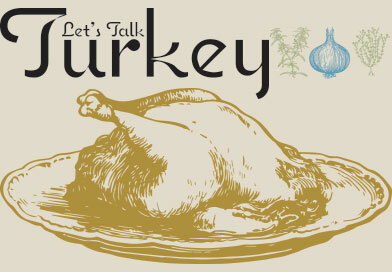 Will turkey be the center of your holiday feast(s) this year? If so, then you’ve got a lot to consider when it comes to choosing and preparing it: Heritage or broad breasted? Salted or brined? Roasted or fried? Fresh or frozen? In answering the fresh-versus-frozen question, consider both taste and convenience when making your final selection. If you can’t find fresh turkeys, frozen are fine. Just be sure to follow Ted Scheffler’s defrosting and brining tips. Typically, fresh turkeys, whether heritage or broad-breasted white birds, are raised free-range, which will result in a stronger, more natural “gamey” flavor that reflects their habitat. It’s also unlikely that they were treated with hormones or antibiotics so while they may be smaller, they can also be juicier, without any additional additives. But if convenience is key —since most fresh turkeys are only available around Thanksgiving because of production times and/or you simply may not have refrigerator space for a fresh bird—you might find that a frozen bird will better suit your purposes. For fresh turkeys, Wight’s Fresh Turkeys in Ogden has a limited number of fresh birds available for pre-order by phoning 801-731-3760. Birds will be available in early November for $2.69 per pound and can be picked up at their retail outlet through Nov. 25th. 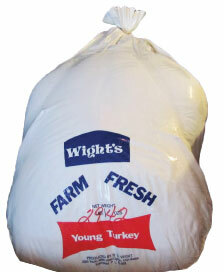 If you’d rather get your Wight’s turkey in Salt Lake, several stores are accepting pre-orders. Contact The Store in Holladay at 801-277-3047, Meiers Catering in Holladay at 801-278-4653 and Main Street Quality Meats in Salt Lake City at 801-484-5295. 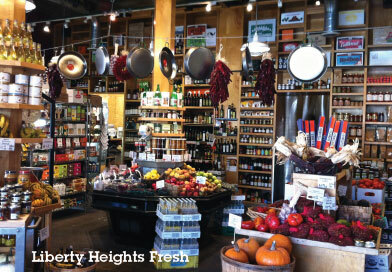 You can also find Wights turkeys at Meiers Meats and Fine Foods in Highland at 801-642-2069. Salt & Smoke Meats will also be selling turkeys from Wight’s for $4 per pound raw, $5.50 per pound brined and $6.50 per pound smoked. Utah Natural Meat’s turkeys are fresh-frozen and available on a first-come, first-serve basis in November at their farm store in West Jordan for $5 per pound (running 10-25 pounds.). Their broad-breasted white turkeys are pasture-fed on sprouts, grass, rolled oats and insects and are growth-hormone and antibiotic-free.